Are you always on a hunt for penny stocks in the stock market? If you are one of them, then perhaps you are also looking for low price share list that has the potential to become a multi-bagger stock. Multi-bagger stocks can create a huge amount of wealth for you. All you need is the patience to hold the shares for the long term. Penny stocks don’t mean only low priced shares. You can focus on shares with low priced which have the potential to be a giant and add value to its clients and shareholders. You can dive into after understanding fundamentals and technical aspect of penny stocks. Penny stocks may have their share price low but they are not small businesses at all. To make money in penny stocks you need to consider the value of a share and not the price. You will not make a single penny if you have a gambling instinct. So, don’t get attracted to small priced stocks despite knowing the risks involved and all sorts of warnings. So, before you invest in any penny stocks, carefully analyze fundamentals and technical data. Invest nominal amount of only 3-5% in penny stocks of your corpus. Moreover, you must do your own research thoroughly before any investments and don’t just get carried away by rumours. Although there are many low price stocks listed in NSE and BSE. However, I just scan low price share list based on different parameters. Penny stocks are highly risky and they have relatively low volume. You need to keep an eye on these stocks continuously. They may get de-list from stock exchanges and you may not be able to sell them. Investing in low price share is just a hope trade. You need to make up your mind before you invest as fundamentals and technical analysis hardly help you. However, high risk always rewards you with high return. Your risk-reward ratio is good while investing in penny stocks. Furthermore, make sure you put up to 5% of your investment and don’t put all your money in a single penny stock. 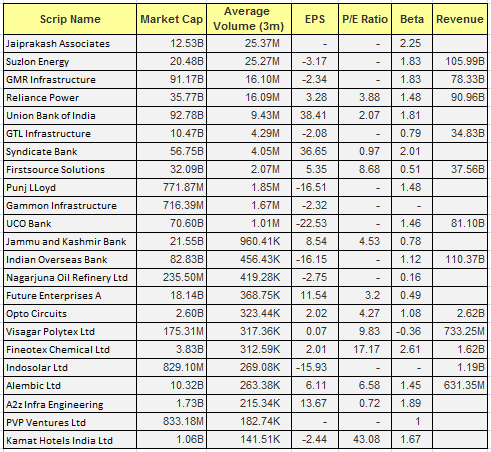 While writing this post, I wanted to know the stocks that have run a lot in the previous years. I never heard about these stocks and they zoomed more than 1000 per cent in 2018. So, I list them out all. However, there are many stocks apart from the below list which has given a return of more than 100x, 500x or 800x. As investment in penny stocks is highly risky and so, it may be best to keep away from them. However, high calculated risk also rewards you a high return. You can get all the details by screen them out. Investing in these low price shares has a very good risk-reward ratio. Imagine if you invest 1000 shares @ Rs. 1/-. So, your total investment amount will be Rs. 1000/- only. In case the stock price becomes zero, then you may lose Rs. 1000/- only. Having said that, if the stock started to rally and move on your desired direction then you will be delighted. So, investment in these low price share of Rs. 1000/- is not a bad idea. You may be spending Rs. 2000/- on your weekend enjoyment or shopping. So, instead of spending, just invest. You will be amazed by the profits you will make. So, if you are a high-risk taker investor, then you can consider penny stocks to buy. You can make a portfolio of low price stocks with that 10-15% of your corpus that has the potential to grow big. Either way, do let me know any other low price share that may become a multi-bagger stock. You can comment below your ideas and suggestion. If you like this post, kindly share it on your facebook, twitter, and other social networks. That will make my day! Can Urja global ,vedavaag,fineotex chem, meghmani organics, Rajoo engineers and sanwaria can become a multibagger? Your post 2as very nice and I read you articles regularly. Please help me in this penny stocks. You can invest in all the stocks that you have mentioned except Sanwaria. However, invest only a small corpus of your investment capital.